As technology solutions evolve to meet the increasing business demands of modern companies, IT organizations must work quickly and efficiently to keep up with those demands, both internally and for external customers. For many businesses, this means revisiting and optimizing current IT Service Management (ITSM) processes and maximizing value of IT services offered. With the right documentation, processes, management commitment, and collaboration, organizations can align IT and business strategies and deliver value to customers without compromising quality or being stretched too thin. You may know that service management refers to the specialized capabilities and services that an organization offers in order to provide value to customers. IT services include applications, data processing, infrastructure, and even printers, laptops, and password resets. Anyone who works on any part of these services in any given stage will say ITSM is more than IT support and the services alone, however. It also refers to how these services are managed. ITSM outlines the end-to-end responsibility of each service, from managing applications, data storage, and cloud computing. Often, ITSM is paired with the IT infrastructure library (ITIL)—a framework comprised of five separate publications that outline flexible best practices and processes for ITSM, but your organization may use COBIT for alignment and IT governance. Whichever supplemental framework you use, the basis of ITSM is to ensure services run smoothly throughout the design, delivery, management, and improvement stages. Rapid development and outsourcing require that IT organizations be cognizant of the ever-changing needs of business goals and operations. This means IT teams must balance being flexible and accommodating with their own short- and long-term limitations and bandwidth. You cannot manage what you cannot control. You cannot measure what you cannot define. Thoughtfully implemented ITSM processes will help you manage, control, measure, and define the moving parts and processes in your service lifecycle—the ITSM framework provides enough guidance and flexibility to meet your businesses needs. Ensure you have the proper people, resources, and procedures in place. Because when you do, you ultimately enable your organization to get to the root of issues when they arise, replacing downtime with time spent delivering value to customers. You probably have specific procedures in place already and have seen the benefits of ITSM. But with the right ITSM tools, you can improve existing processes to increase the probability of your desired outcomes. We think Lucidchart can help. Successful ITSM efforts require trust, specialization, and coordination in all stages. To do this, you need more than a good ITSM application, but a central platform that helps you facilitate collaboration and shared understanding across the service lifecycle. If you do this, you can empower your service management organization to become more productive and efficient while aligning strategic efforts between IT and business. Remember to define, measure, and control. You can maintain control over your processes and keep teams up to date with Lucidchart. The graphic representation and diagramming powers of Lucidchart help you visualize your goals and objectives in context, document specific and relevant actions, define your measurements, and track your outcomes. Access the latest version of a document and all prior revisions. 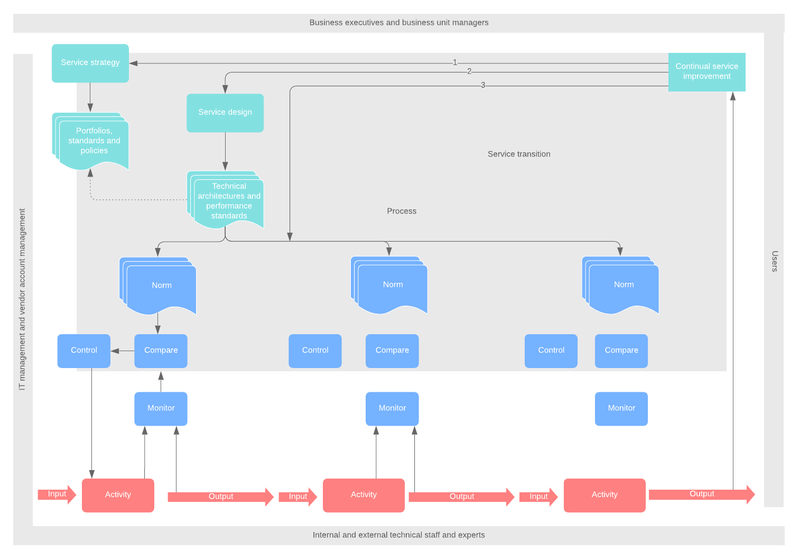 Let’s further explore how Lucidchart can ease the ITSM processes. Quickly create clear visuals that delineate processes, people, and technology—from simple process flows to complex and technical infrastructure diagrams. You can map out your current and future states and outline how to raise your IT maturity to an optimized level. As you implement and refine processes throughout the ITIL Core stages, spend less time trying to outline your processes and more time actually implementing them. 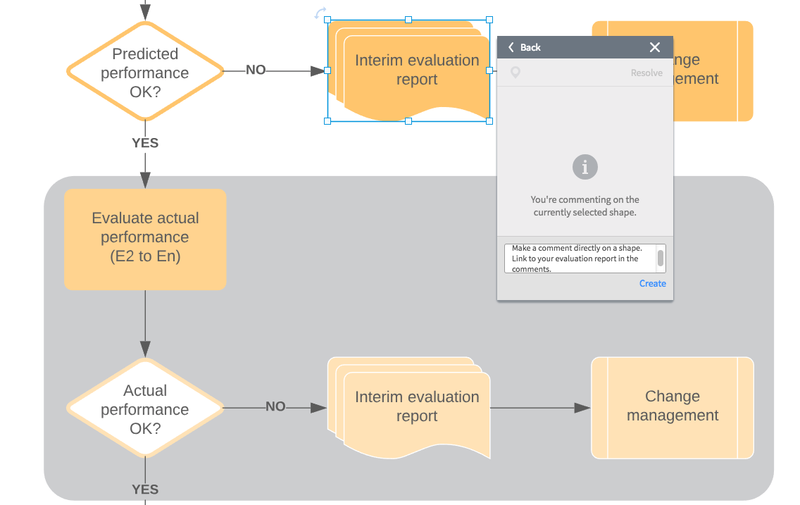 From the Lucidchart template picker, choose and tailor a diagram for process reviews, change management, security management, tollgates, business relationship meetings, control loops, and more. Service management processes are best implemented when the roles and responsibilities within each function are clearly delineated early on. The functions are the specialized teams or groups with the skills, knowledge, and resources needed to complete a specific job and deliver the desired result. So, as you solidify your processes, never second-guess who does what. Create a swimlane diagram or Gantt chart to outline responsibilities and roles to improve productivity across cross-functional teams. Real-time collaboration is a core part of the Lucidchart experience and should become a fundamental part of your service management strategy. Your team members can view edits and discuss the work without ever leaving the platform. Never work in silos again. Don’t worry about updating the guy who missed the Monday afternoon call or your remote employees who missed the water cooler chat. Ease the Mac vs. PC frustration—hardware and software incompatibility is no longer a barrier to collaboration. The cloud-based Lucidchart platform lets you work together from anywhere in real time, and it works on any operating system or device. Make sure your teams are on the same page at all times with version control. You can share documents with any number of users without the hassle of multiple versions buried in emails or scribbled on Post-it notes. The most recent version of your diagram and flow is always online for collaborators to access. The revision history log allows you to review and revert whenever you want. Solicit and provide feedback using the chat features, in-editor commenting, and @mention notifications. As your diagrams grow, you can use the comment locator will lead you directly to the reference point. Your diagram permissions can be customized for any scenario by separating owners, editors, commenters, and viewers. For sensitive projects, you can easily disable online publishing or restrict sharing to specific domains. ITSM processes can range from relatively simple to complex and convoluted for non-technical employees. Whether you’re building and sharing intricate or high-level diagrams, Lucidchart streamlines the sharing process. Use presentation mode, publish a URL, or export a diagram to share with senior IT management, internal IT, or the Change Advisory Board for review and approval. It’s quick and easy to deliver focused presentations when you select specific sections of your diagrams and flows to share. Spend less time making presentations and more time solidifying improving processes and informing stakeholders. Embed polished process flows and diagrams into popular apps you already use, including Confluence, Jira, G Suite, Microsoft Office, Slack, and more. Only Lucidchart syncs across Confluence, Jira Software, and Hipchat, creating new opportunities for shared understanding via Atlassian. Easily document ideas visually in Hipchat then seamlessly embed in Confluence for future reference or attach to Jira Software issues to take action. 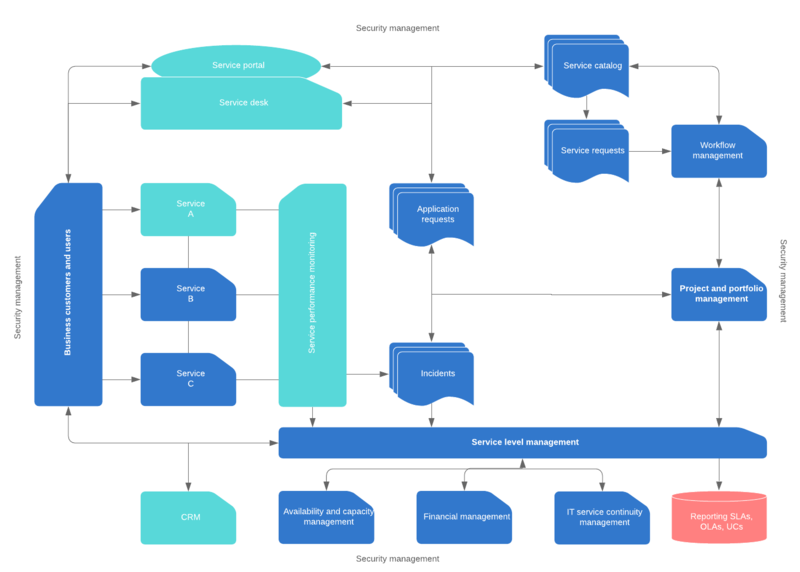 Whether you’re a seasoned ITSM organization or you’re just getting started, leverage the possibilities of Lucidchart to maximize the power of service management. 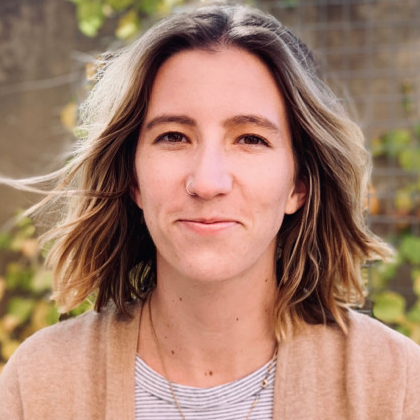 Lizz Corrigan graduated from the University of Utah in English and has since rooted herself in marketing. She is a senior content marketing specialist at Lucid. When she isn’t contributing to local magazines or pouring herself yet another cup of Joe, she likes to run and mountain bike with her blue heeler mix, Waylon.